In a letter sent late Wednesday, Chairman of the House Oversight Committee Darrell Issa reminded Health and Human Services Secretary Kathleen Sebelius that obstructing a congressional investigation is a crime. Issa's Committee has been looking into the details of how Obamacare was implemented, along with the major problems with Healthcare.gov and has requested a number of documents from HHS, none of which he's received. The documents requested pertain to companies hired by HHS to build and operate Healthcare.gov. "The Department [HHS] subsequently instructed those companies not to comply with the Committee's request. The Department's hostility toward questions from Congress and the media about the implementation of Obamcare is well known. The Department's most recent effort to stonewall, however, has morphed from mere obstinacy into criminal obstruction of a congressional investigation," Issa wrote. The letter details a contract between HHS and Creative Computing Solutions, Inc. (CCSI) forcing the company to get approval from the Centers for Medicare and Medicaid Services before cooperating with Congress, making it nearly impossible for lawmakers to get documents from the company directly. CCSI has been citing the contract as the reason why they cannot turn over requested documents to Congress. In the letter, Issa indicated this refusal by CCSI under the thumb of HHS could be criminal obstruction of a congressional investigation. "The Departmen't instruction not to cooperate with congressional investigations relies on language in the contract with CCSI which precludes contractors from sharing certain data with third parties. Moreover, the Department explicitly forbids the release of documents without authorization from CMS. That argument -- that the language in the contract between the Department and a private company supersedes Congress' constitutional prerogative to conduct oversight -- is without merit," Issa wrote. "In fact, it strains credulity to such an extent that it creates the appearance that the Department is using the threat of litigation to deter private companies from cooperating with Congress. The Department's attempt to threaten CCSI for the purpose of deterring the company from providing documents to Congress places the officials responsible for drafting and sending the letter on the wrong side of federal statues that prohibit obstruction of a congressional investigation. Obstructing a Congressional investigation is a crime." Issa instructed Sebelius to inform HHS officials to immediately stop directing employees and contractors not to turn over Healthcare.gov documents to Congress. He also reminded Sebelius that a subpoena was issued to her on October 30, 2013 and requires a response. 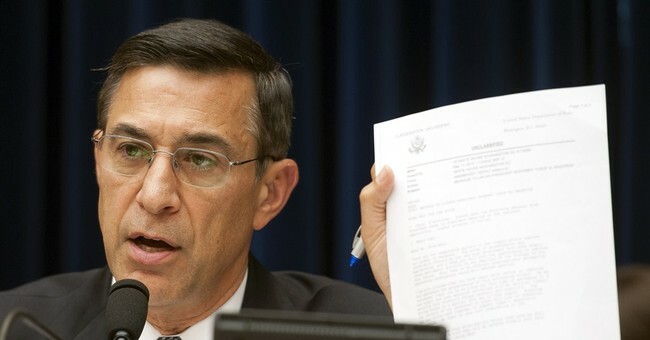 "Private citizens and companies cannot contract away their duty to comply with a congressional request for documents," Issa said. "Furthermore, the Department's instruction to CCSI and other contractors not to respond to congressional document requests runs afoul of a federal statute that prohibits interfering with an employees' right to furnish information to Congress. Under that statute, any effort to enforce a contract that prevents a federal employee -- or in this case, a contractor -- from communicating with Congress is unlawful." Thursday, the Oversight Committee will hold a hearing about Obamacare's impact on premiums and provider networks as millions continue to see skyrocketing insurance rates, loss of health insurance and a loss of preferred doctors.